Hundreds of vehicles on Wednesday pushed into Mosul's rubble-strewn streets to begin a massive clean up campaign, nearly a year after Islamic State group jihadists were pushed out of their "capital" in Iraq. Largely silent since Iraqi forces fully recaptured the city on July 10, Mosul's Old City awoke to the roar of trucks, bulldozers and excavators chugging though its debris-filled neighbourhoods. 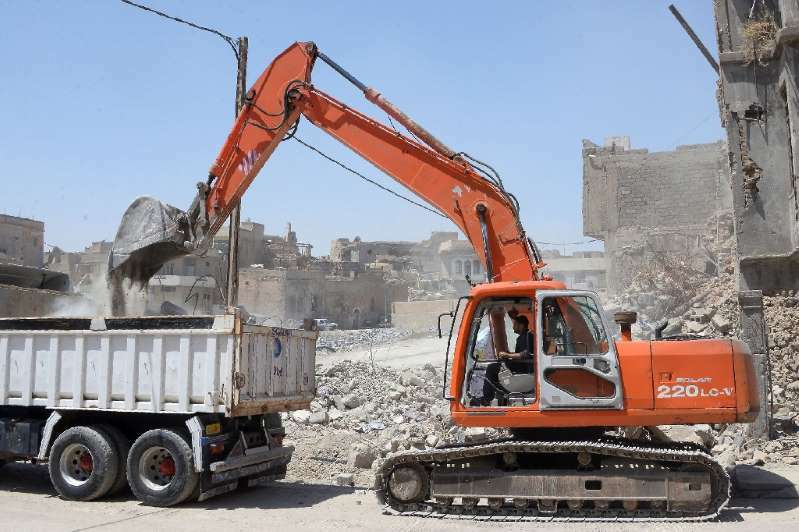 "More than 300 transport cars and trucks took part" in the first day of the campaign to clear the Old City, said Jamal Sellu, director of engineering in Iraq's northern Nineveh province -- of which Mosul is the capital. "This is the first of its kind and there are more than 10 million tonnes of debris," he added. Some of the ancient city's most narrow streets will have to be cleared by hand. Clean-up efforts have been delayed a year because there's been no financial aid from Baghdad, the engineer said. "All participants in this campaign are working in hopes they'll be paid when the funds arrive." The UN estimates it will take "years" to clear the debris from Mosul. In November 2017, Iraqi Prime Minister Haider al-Abadi estimated it would cost more than $100 billion to repair the damage caused during the three-year jihadist occupation of the city. According to Nineveh governor Sultan Nawfal al-Akub, the clean-up operation will continue until Mosul's displaced return to their homes. "We don't want these ruins anymore. We want water and electricity and to rebuild our homes," said Sabah Mahmud, 53-year-old who still has not returned home to Mosul. As of October there were 700,000 Iraqis from in and around Mosul still displaced, according to the Norwegian Refugee Council.